To gobo or not to gobo? 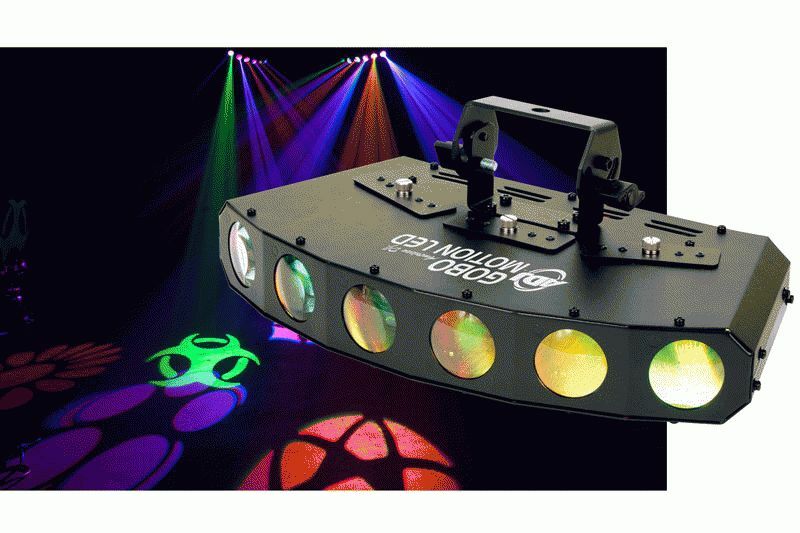 Now clubs and mobile entertainers don’t have to anguish over this question, because American DJ has unveiled the Gobo Motion LED, a fast-moving Tri-Color LED lighting fixture that is both a multi-gobo fixture and solid color beam effect in one compact unit. A portable scanner-type effect, the Gobo Motion LED is equipped with 6 replaceable, removable gobo patterns. You can run it with its gobos to create exciting quick-scanning patterns across walls, ceilings and dance floors – for an eye-popping visual contrast to your other LED effects. Or, for an entirely different look, you can remove the gobos and use it to project 6 solid colored beams of light. This innovative 2-in-1 fixture gives DJs, small clubs and mobile performers the flexibility to create diverse effects in their light show without having to buy or transport multiple units – and provides a super value for their lighting dollar! Whether the gobos stay or go, the Gobo Motion LED will really “go”— moving at a fast, furious pace that will electrify any dance club, party or performance. Its high-action beams come from six 3-watt Tri-Color RGB LEDs (red, green and blue in one lamp source) that can create a variety of color effects. Add the unit’s color strobe effect, 0-100% dimming, and exciting built-in programs, and you’ve got all the tools for a knockout LED light show. “DJs, working bands and small clubs are demanding more flexibility and versatility their lighting effects today. The Gobo Motion LED really hits that nail right on the head,” said Alfred Gonzales, national sales manager for American DJ. “Every mobile entertainer needs a creative change-of-pace gobo effect and a solid color beam effect in their lighting toolchest, and now they can buy one unit that gives them both – along with some other fantastic effects like high-speed movement, a strobe and a dimmer. Another very handy thing about the Gobo Motion LED is that you can replace its gobos with your own custom patterns, so you can use it to project everything from a company logo at corporate functions, to a bride and groom’s names at weddings,”. The unit’s gobos are 20.5 mm in diameter and have a 12 mm. viewable area. They can be easily removed and replaced with custom gobos to personalize a wedding, corporate banquet or other event. The Gobo Motion LED features a beam angle of 8.5° for a single beam and 75° for multiple beams. Users can operate the Gobo Motion LED in 3 different modes: DMX-512 (1, 3 or 18 channels); Sound Active; and Master/Slave. When in Sound Active and Master/Slave modes, it will run to its own internal programs, allowing even the most inexperienced lighting users to produce a stunning, professional-caliber light show. A 4-button Menu System with LED display on the rear makes it easy to navigate through settings. For another convenient control option, the Gobo Motion LED is compatible with American DJ’s UC 3 controller (sold separately), which can be used to turn the unit On/Off and scroll through its programs. Up to 9 Gobo Motion LED units can be power linked together via the fixture’s IEC connectors. With 50,000-hour-rated LED lamps and no moving parts, the Gobo Motion LED is also a very reliable effect that requires little maintenance. It can run all night without duty cycles, thanks to its cool operating temperature. It’s energy efficient too, consuming just 39 watts of electricity at maximum use. The Gobo Motion LED includes multi-voltage operation: AC 100V-240V, 50/60Hz. It comes with a convenient hanging bracket and safety hook. Designed for easy portability, it measures 17”L x 8.5”W x 5.75”H/ 428 x 211 x 143mm and weighs 8 lbs./ 3.6 kg.